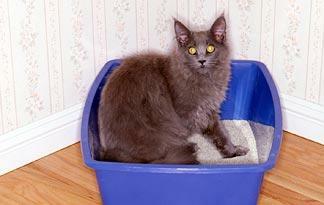 Learning to use a litter box is pretty much instinctive for cats. Still, there are some helpful tips for making the process goes as smoothly as possible. The first is to show your new pet the litter box as soon as you bring him into your home for the first time. Don't worry if he hides at first -- this is normal. Experts at Washington-based animal shelter and wildlife rehabilitation center PAWS recommend just placing the litter box wherever your cat feels comfortable and then gradually moving it to your preferred location. You should also place your pet in the litter box after naps, meals, play sessions, and whenever you think he appears inclined to "go." Keep this up during the first few days of your relationship with your new pet, and you should achieve litter box success in no time.